Returning to school after the long summer break comes with new and uncreased books, perfectly sharpened pens, and an unparalleled ambition to create better and healthier lunch boxes for your kids to reach their full potential at school. As such, here are a number of recipes for you, along with useful tips for how to create new and nutritious lunches for your little ones. Even if your children like their ham and cheese sandwiches, they’ll get bored of them eventually and appreciate the discovery of new items in their lunch boxes. Variety—in terms of the types of foods, their colors, shapes, sizes, and flavors—will enable your kids to choose from an exciting selection and get their fair share of grains, protein, dairy, fruit, and veg. Instead of bread, why not try a savory muffin, a salad, or a selection of smaller snacks and dips. The best food for fabulous lunch boxes comes in small sizes. But, if you’d like to stick with the tried and tested, there is a lot you can do to shake up your white sandwich bread. Cookie cutters, for instance, will turn your square slice into a star, moon, rocket, heart, or whatever you want it to be. Even fruit and veggies can be shaped with cookie cutters or carved with a small kitchen knife. If you’re strapped for time, simply cut your sandwich into matchsticks or triangles, or roll it up as “sandwich sushi” for a change. Let’s talk about logistics! Meal-planning is the key to a varied, healthy and nutritious diet that keeps young brains engaged. But you don’t need to get up extra early to cook a healthy lunch. Think about your dinner options for the week, and how you can make use of leftovers for sandwich fillers, or as cold snacks. Choose lunch options that can be prepared ahead or batch-cooked. 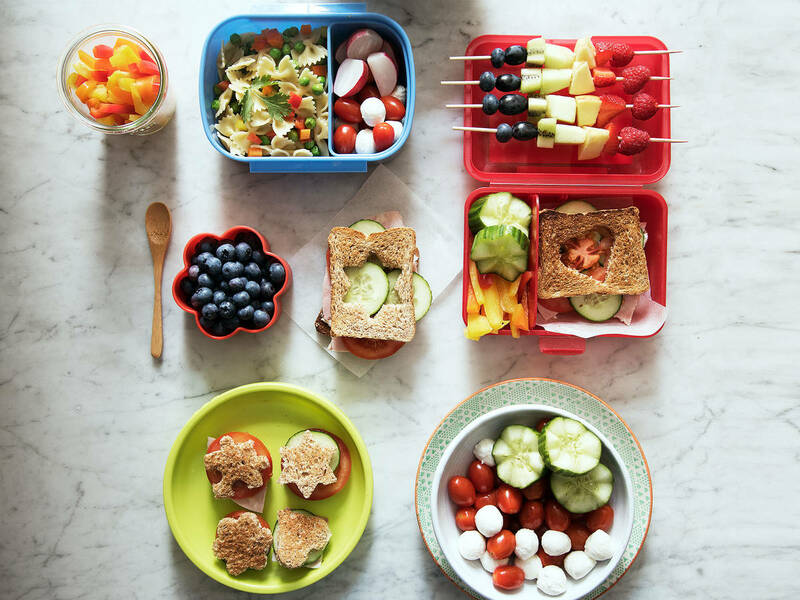 Utensils such as lunch boxes, drink bottles, and food containers can make the lunch experience a lot less messy and more enjoyable for your kids. Bento-style lunch boxes with separate compartments ensure that food doesn’t stick together. Leak-proof drink bottles and smaller food containers can be inserted in an insulated lunch carrier bag (make sure they are BPA-free, a chemical used for the production of plastics that may enter your food and affect your health). With all those items on hand, you can now send your child off to school with homemade dips, yogurts, sauces, and energy-boosting drinks. Something sweet shouldn’t be missing from your kids’ lunch boxes, as they will dig for it first and cheer up when they discover it. There are sweet options that aren’t unhealthy and full of bad sugars, but that will raise your kids’ concentration and boost energy levels instead, such as oatmeal and granola bars, as well as cookies, muffins and breads made from nuts, seeds, dried fruit, or vegetables. Homemade versions are far healthier than store-bought ones. They require some preparation but luckily all can be made well in advance. What did you put in your kids’ lunch boxes today? Share your images in the comments below!